Does Corn Make You Fat? The good, the bad, and the bottom line on corn and corn syrup. What would go through your head if someone set a nice cob of sweet yellow corn in front of you? Lately it seems people are more reluctant than eager to take a bite. In fact, I'm hearing more people say they're avoiding corn altogether because they think it will lead to weight gain. Some are connecting corn (fresh, canned, or frozen) to the bad press surrounding high-fructose corn syrup. Others have seen documentaries like King Corn or Food, Inc. (or read other stories about the damage corn can do to cows) and are banishing corn from their humans diets. But my diet is heading in the opposite direction. After attending the Make Half Your Grains Whole! conference earlier this year, I've put corn back on the menu. (Details on exactly how I'm eating corn and other whole grains are coming next week.) This week, I wanted the truth about this veggie, so I did a little digging and had Marisa Moore, a registered dietitian in Georgia and a spokesperson for the American Dietetic Association, break down the chatter about corn. Here's the good, the bad, and the bottom line. 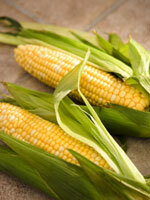 "Corn is a whole-grain product, so you can include it in a healthy diet," Moore says. "The goal is to get half your grains from a whole-grain source, so if you include corn, have half a cup. It also provides vitamin C and fiber." And the Whole Grains Council points to research showing that corn has more antioxidants than any other grain. To get all of the good stuff, though, you have to read labels to be sure you're getting whole-grain corn. "People love grits, but grits are not usually whole grain." (There are a few sources of whole-corn grits, like Anson Mills and McEwen & Sons.) Another one? Popcorn. A study earlier this year showed that people who eat popcorn tend to eat more whole grains. That's a no-brainer. As is Moore's advice that deserves repeating: "Practice portion control, especially with buttered popcorn." The difference between buttered and 97% fat free can be hundreds of calories. So, does corn make you fat? Not exactly. Though Moore explains that it has more calories than non-starchy veggies like spinach, she says it's all about portion control: "You just have to watch the amount you eat. Like anything else." Now onto the confusing topic of high fructose corn syrup. Personally, I avoid it, but the most recent studies show it's not anymore likely to make you fat than any other sweetener. "It's important to make sure to minimize all the added sugars in your diet," Moore says. So treat it like any other sweetener, and use it sparingly. "Sure, corn's a starchy vegetable, but it's not necessarily bad for you," Moore says. She advises people to make room on their plates for corn and a variety veggies. Corn isn't my only veggie, nor is it my only whole grain. But it certainly is a fave. Next week, see how I'm getting my antioxidants and fiber through corn—and some other tasty grains, too.